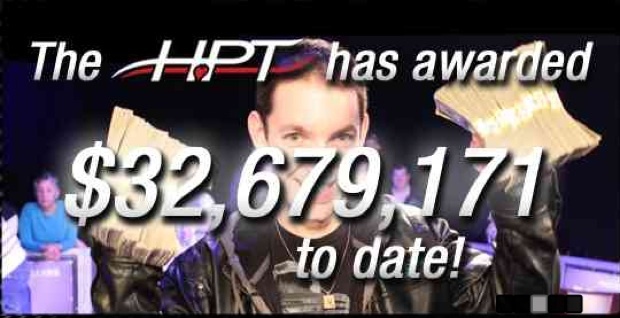 The HPT has grown to become the most successful North American poker tour. Editor’s Note: The following column is the second in our on-going “”Underreported Success Stories” in poker. Last month we featured Dominik Kofert and PokerStrategy. This month, we look at the unlikely success of the Heartland Poker Tour. Imagine you’re in venture capital. Two guys with a dream from North Dakota enter your office. They present a business plan. They want to start a televised poker tour syndicated in local markets mostly across mid-America. Unlike the WSOP Main Event or WPT, the buy-ins will be affordable for the everyday Joe, around the $1,500 range. Even better, the broadcasts will mostly star players you’ve never heard of or seen. And neither of the the two guys with a dream has ever produced a poker show. And they have no sponsors. Would you fund it? Or give it any chance for success? Meet the Heartland Poker Tour, one of poker’s most unlikely success stories. In six years, the HPT has seen over 90,000 entries into their events. They’ve awarded over $32M dollars in main event prize money. They have genuinely passionate players attached to their brand. In 2012, HPT will hold their milestone 100th event. To highlight their success, we interviewed HPT co-founder Todd Anderson to determine how he and business partner Greg Lang built the country’s most successful poker tour. WCI: Neither you or [co-founder] Greg Lang had background necessarily in poker or gaming. Where did you come from? TA: I cut my teeth in radio sales in the Fargo Moorhead market, selling a classic rock station. After a few years in radio I moved into TV advertising sales and soon was promoted to General Sales Manager at the Fargo Fox affiliate. For the next 10+ years it was my job to hire and train sales people and manage the station’s ad inventory. It was during this time I met Greg Lang, a local small business owner in Fargo. Greg and I did some advertising campaigns together. He was a franchiser of a sporting good store as well as a franchise developer for a nationwide sandwich chain. WCI: What was the thought process behind starting HPT? Did you identify a business need that wasn’t being served? Did your peer group express the need for a tour like this? TA: Greg and I started playing some poker together in 2004. By then the poker boom was well under way and we were occasionally driving 70 miles to our nearest casino to play in a Tuesday night tournament. It was during one of these trips that we first started discussing what would later become the HPT. We were lamenting the fact that the only TV poker out there was super high buy-in events like the WPT and WSOP. We agreed that we would be the type of players that would like to play in smaller buy in events that were televised. Our reasoning is that virtually any poker player would love that chance to play on TV but very few could afford 10k buy-ins. Some time passed until one day Greg called my office and said “we should produce our own poker show.” In the next few weeks we put together a business plan. It was also during this time that I was home for the holidays watching TV with my brother, a non-gambler or card player if there ever was one. I had the remote and purposely found a WSOP show. After we watched it for 20 minutes I abruptly changed the channel. My brother said, “Hey I was watching that!” It was after that little experiment that convinced me that TV poker had some staying power. WCI: The Heartland Poker Tour name can either be considered very limiting or a stroke of genius. Give how far you’ve come, it’s probably the latter. How did you settle on the name HPT? TA: We kicked around a bunch of possible names for the tour including “Min-Dak Poker Tour” “North Star Poker Tour” “Midwestern Poker Tour.” Finally one day I was watching TV and saw an ad for “Heartland Chevrolet,” and it clicked. Wasn’t too constricting, and said everything we wanted the tour to say. Seven years later we’ve outgrown the name but it still works. I decided a long time ago that most Americans feel as if they are in the Heartland. My philosophy is that if you don’t wake up and see an ocean, you’re in the Heartland. WCI: Good move not going with Min-Dak. What were your biggest challengeswhen you started the business and how did you overcome them? TA: Far and away the biggest challenge was actually producing the TV show. Neither of us had any idea what we were biting off when we told our casino clients that we were going to produce a broadcast quality TV show. We were very naïve about the complexity of the final table shoot as well as the overall cost of it all. Looking back on it now it’s quite remarkable that we were able to do it. We started the company on February 1st 2005 and pledged that our show would premier on local stations that Fall. Our first HPT event occurred in June of 2005 and the first episode debuted the first week of October after weeks of non-stop editing. No one on our team had ever produced a poker show so it was an unbelievable challenge. The guy we hired to edit the show worked 22-hour days the final week to get it done. He would take hour naps on his office couch and didn’t go home for days. It was pretty stressful. Another incredible challenge was getting TV stations to even consider airing the show. We quickly learned that programming directors gave us zero credibility, and rightly so. We had no credentials whatsoever to produce a TV show. For that reason none of our regional TV stations agreed to carry the show. We were left with no choice but to “buy” the time on stations in Minneapolis, Fargo and Duluth. We were relegated to “infomercial” status, a very humble beginning. Yet another challenge was getting casinos to host the events. Casinos are by their nature very suspicious of vendors. Here we were promising them we could actually produce a show that was worthy of airing on television and secondly we could get stations to air it. Luckily we were able to convince a few casinos in Minnesota and Wisconsin that we could pull it off. WCI: Looking back at the first couple of years–anything you would’ve done differently? TA: We learned very quickly the first year what could and couldn’t work and naturally blew a lot of money while making mistakes. The first show took 320 hours of editing time (at $150 an hour) so it didn’t take too long for us to make the investment in our own editors and equipment. Our set was also way too big and cumbersome during the first year and was rented. Again, we learned to invest in our own equipment and tailored it to fit in tight spaces (handy for both casino shoots and travel). The only other thing I would have done differently, if we could, would be to go back in time and start it sooner. We were about 18 months too late to get in on the flood of online poker money that would have been available to us had we started right away in 2003. WCI: Your success was under-the-radar for years. When did you start noticing a difference in how recognized your brand was getting? TA: It really did take a while for anyone to really pay attention to what we were doing. It took years for our brand to permeate the poker community. It took several years, dozens of events, and thousands of airings on a very strange syndicated network of TV stations for us to slowly build awareness for the brand. If there was one moment that I would say was a realization of that effort, it would be the Red Rock event in 2010. We were so paranoid to go back to Vegas (we bombed at Hooters Casino in 2007) that we charted four jets from four cities in an effort to build the field with poker players. We also did our first charity event, which was terrifying. We had very few relationships with any sort of celebrities and had many sleepless nights fretting about how we were going to get celebrities to play our event. Honestly, at the end of the day it was very gratifying. The jets were full of enthusiastic HPT fans, the casino did an amazing job, and we had 20 celebs in the charity event for Disabled American Veterans. The highlight of my week was when Kathy Liebert told me it was the most fun she’s ever had at a charity event (and she’s done hundreds). That weekend people started looking at HPT differently. We had a front-page story in the Las Vegas Review Journal, we sold out the Main Event, and even Wicked Chops and Raw Vegas starting paying attention to what we were doing. WCI: Did Black Friday cause you to adopt a different approach to your business? TA: It hurt because we lost a .net poker sponsor on April 15th, 2011. Over the years we’ve had very little revenue from .net poker sites so it was disappointing to lose that sponsorship due to Black Friday. The good news is we built our business without such sponsorships so we’ve been accustomed to doing so for a long time. We’ve been on solid ground for years and Black Friday was just a bump in the road. Our business is to market and film great events for the everyday poker enthusiast. Our clients are both casinos and poker players. As long as we continue to put on great events and put out a great TV product, the HPT should be around for a long time. Lastly, in 2011, we made the conversion to High Definition, which allows us to keep pace with the industry. WCI: You recently were acquired by Federated Sports+Gaming/EPIC–why did you make that decision? TA: I’ve known Jeffrey Pollack since he first became the WSOP commissioner. Somehow I got a meeting with him in early 2006 as we were entering our 2nd year of existence. I remember putting a very ambitious proposal in front of him to bring HPT to Harrah’s casinos. Of course he said no, but he also was one of the first real industry people to give us the time of day. Pollack really liked what we were doing and was very encouraging. About two years ago Pollack offered me a glimpse into what he was planning with what would eventually become Epic Poker. He also hinted that someday when his plans became a reality he would like to sit down with us and see what could be done together. The reason we merged HPT with Federated/Epic is we felt as if we’d reached the point of diminishing returns on our own and wanted to take our company to the next level. We felt that the team behind Federated gave us the best chance to do so. For two guys from Fargo ND, it’s been a wild ride. In a nutshell I think the Federated/Epic relationship gives us the horsepower we never thought possible six years ago. I’m excited to see where it all goes. WCI: What can your dedicated HPT’ers expect to see from you in the next year or two? More of the same? Or some changes? TA: There will always be changes. We’ve spent almost seven years growing this brand through constant improvements to both the events and the TV product. In 2012 we are going to address the number one complaint we’ve had from our player base, that being the HPT structure. We are very unique in that most of our players hold normal Monday through Friday jobs. Up until now we have worked real hard to make sure people came to our events, had some fun, and knew they were going to be able to go home Sunday night. It’s been a successful formula but the drawback is we’ve never had the most desirable structure in place. We were always forced with too little time to offer the best structures. This next season we’ve decided to take a bold step by greatly improving the structure. Because our events continue to grow in popularity, we don’t have to spend as much time on satellites and qualifiers and can shift that time to the main event. Therefore, we’ve added several levels as well as more time to the levels. Moving forward, almost all HPT events will be three-day events and almost all events will conclude on Monday when we shoot the final six players. In the past players have compared us unfavorably to other tournament structures, namely the WSOP Circuit. Because we are a TV show and it takes more time to film the final table, it has been necessary to shorten the tournament running time simply to get everything in. This season we plan to start the events sooner, run them longer, and shoot them later. In addition to the new and improved structure, you can look to find the HPT in new markets in the coming year. We are always hearing from poker players in all parts of the country to bring HPT to their hometown. Very soon we hope to announce new HPT venues in Atlantic City, Pennsylvania, Missouri, New Mexico, California, and Washington. WCI: It’ll be an interesting 2012 for the HPT. How they’re integrated with Epic Poker and how that impacts their tour remains to be seen. And new tours–like the Deepstacks Poker Tour and Native American Casino Poker Tour–along with long-term competiting brand WSOP-Circuit–threaten to syphon off some of their customer base. For the first time in their history, the HPT has a target on their back. They’re the ones everyone else is gunning against. It’s something two guys from North Dakota probably never dreamed would happen. But it’s something that only happens when you’re doing something right. Visit the Heartland Poker Tour website here and follow them on Twitter here. Previous Post The WCOFF Sounds An Awful Lot Like Full Tilt Next Post How Will the DoJ's New Stance on Wire Act Impact Internet Poker in 2012?